If you aren't up with the times and aren't sure how to be a funny first grader, you can refer to this list of April Fools jokes of the day.And instead of just saying April Fools, you need to include the word "day" at the end. And don't give the person any time to process what you said-instead, immediately say the phrase after the joke. My nose is running. APRIL FOOLS DAY! Your shoe is untied. APRIL FOOLS DAY! It's raining cats and dogs! APRIL FOOLS DAY. There's an airplane, look! (say this inside of the building for better effect). APRIL FOOLS DAY! There's something on your shirt. APRIL FOOLS DAY! And the one that seems to be the most popular: There's a spider on your head!! APRIL FOOLS DAY! I accidentally placed all of the April calendar days in the pocket chart being one day off. That wasn't done on purpose to trick the kids, but they thought so. On purpose, I gave them a list of directions to follow as part of their seatwork. The catch was they were supposed to read through everything before doing and the last thing told them to flip their paper over in which they were informed that they didn't have to do any of the silly things (shouting their name, tying and untying their shoes five times, spinning circles, hopping on one foot, constructing paper hats, etc) Every single one of them fell for it. 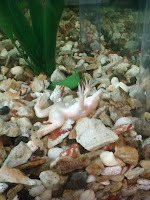 I noticed that the frog in our class aquarium (which admittedly, scares me a little bit. He's albino. Not that that's why he scares me-he's just a little odd looking) was lying on his back. If you aren't a frog expert, this is not normal behavior. I figured he was dead. I told Donna about it later which brought it to the attention of the students. At this point, he was not standing up at the bottom of the tank, not moving. I figured that the water had moved him that way. Then the kids started saying that he was alive and moving-again, probably the water moving him around. But Donna poked him with the yard stick and he did move, but was quite obviously on his way out. He flopped around and ended up on his belly again, fighting with what little strength he had to flip over. The kids thought he had played an April Fools joke on them. Sadly, I think he's really dead now. And it's not the newest of frog tricks. He's not getting up this time. It's windy as all get out today, and of course I had recess duty. No April Fooling there. A child of mine barfed in the hallway this morning as well. And if you know me, you know I don't do vomit. Of any sort. No fooling there either. True story. Thanks for the comment on the cards. My e-mail address is heidilynneboos@hotmail.com if you ever want to pass along some Stampin' Up! tips. I remember student teaching just like it was yesterday! Sounds like a lot of fun. Come to my blog and win a bracelet! My e-mail address is design@ellecustomjewelry.com. Please e-mail me the details for the giveaway. I'd love to host one on your blog. Oh no the poor frog and class too! I loved reading your jokes! My 3rd graders weren't too bad this year actually. It just turned out to be pretty much another day. Hey, if you get a minute will you email me at melsboxofchocolates@gmail.com? I have wanted to respond to a couple comments over at my place, but I don't have your address. Your last question was about 30 day shred and if it worked abs, thighs, and butts. Oh my yes! Those are my trouble areas too and I've definitely noticed a difference. Email me so we can chat more. I hope to hear from you soon!! Haha! This post is hilarious Hillary! Nick was sitting here reading it with me and was cracking up at the first grade April Fools jokes! You definitely have the life of a first grade teacher! You are officially broke in with the whole puke thing! However, I do find it ironic that he puked in my room in the exact same spot that my 2nd grade kiddo did. Of all places. Seriously! :D And the frog picture...CLASSIC! I never have my camera so I miss all of the monumental moments like that! Your blog is great and I will definitely be checking it!